This neat sharpener allows you to sharpen your pencil to one of five different tips, simply by turning the top wheel. The lid comes off for easy clean up. 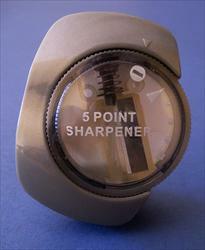 A metal blade ensures that the sharpener will last for a long time (the blade can be taken out and replaced). Sharpener measures 2-3/8 x 1-7/8 inches.